Latest Update: State Bank of India is going to announce the Clerk Recruitment 2019 for various vacancies. Interested candidates can check the SBI Clerk Selection Procedure, language test details from here. 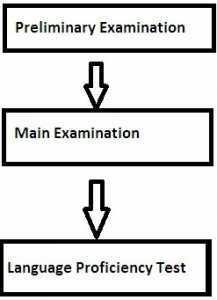 Now as per SBI Clerk Exam Selection Process 2019 criteria, Candidates who qualify the first round, only they will be eligible to appear for the next round (main examination). As per the official notification, for the main examination candidates are selected in 1:10 ( 10 times of actual vacancies)and this ratio is fixed for each category as per total number vacancy. Candidates selection for the next round (the main examination) is totally dependent on the prelims exam cut off marks. Candidates who qualify the prelims exam cut off criteria they are called to appear for the main examination. And here after those candidates who secure the top marks, they are provisionally selected. This is the third phase of selection. The candidates who qualify the first and second round of selection, they will be called for Language Proficiency Test. This test is mandatory for all the candidates. It is conducted after qualifying the online main examination but before the joining. Candidates who fail to qualify this test will not be offered an appointment. SBI Clerk Local Language Test is conducted to, test awareness regarding the opted language, speaking sense, and way of writing of the opted state regional language. Note: Candidates who produce 10th or 12th standard mark sheet/ certificate having evidence of studying opted local language will not be required to undergo the language test. SBI bank maintains a wait list of up to 50% of vacancies (of state-category-wise). Candidates are released from this waitlist on quarterly (3 months) basis against non-joining and resignation out of the current batch only, subject to the candidates securing minimum qualifying marks, which are decided by the Bank. This SBI Junior Associate Waiting List is valid for a period of one year from the date of declaration of final result. Selected candidates’ are kept on a probation period for a minimum of 6 months. In this duration the newly appointed “Junior Associates” are trained to undertake the work of a bank, to learn the fundamentals of the banking system. However, candidates are trained, these things through e-lessons. Further, as the SBI Clerk Probation Period ends, these candidates are evaluated and those employees who fail to meet Bank’s expectation, their training period is extended. Hope the above-provided information will help you to get adequate knowledge regarding SBI Clerk Selection Process 2019. To clarify your doubts further you may ask us through, below provided comment section.